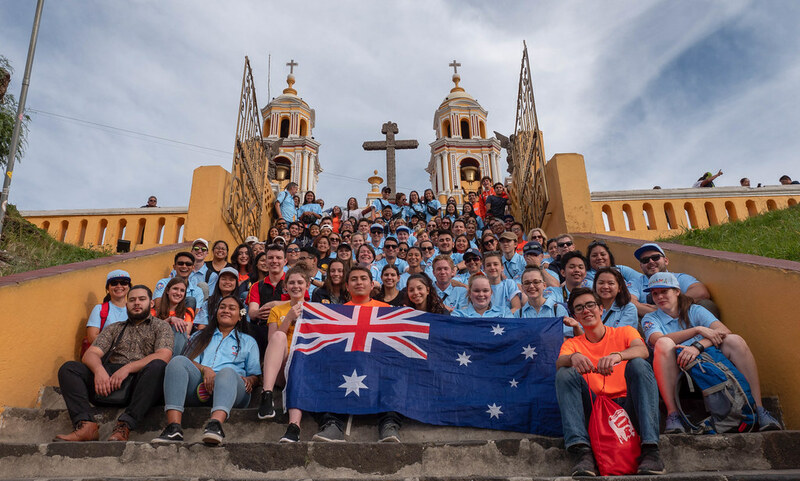 Mariachis, Mexican dancers and performers delighted World Youth Day 2019 pilgrims from the Diocese of Parramatta at a cultural night hosted by the Archdiocese of Puebla’s Seminary of Palafoxiano. The evening began with a warm welcome from seminarians followed by a Mass celebrated by the Archbishop of Puebla, Most Rev Victor Sánchez Espinosa and concelebrated by Most Rev Vincent Long OFM Conv, Bishop of Parramatta and priests from the Diocese of Parramatta and the Archdiocese of Puebla. In his homily, Bishop Vincent called upon the pilgrims to not be content with status quo but to have a “more faithful, generous and courageous discipleship…we cannot be content with the status quo. Following the Mass, pilgrims moved to dinner where they were entertained by an array of local cultural performances in what Bishop Vincent described in his word of thanks to Archbishop Victor as the pilgrims, “highlight of the journey so far”. Mexican cultural dancing is rich in colour and movement, fusing elements of native, colonial and present day Mexican elements. The pilgrims from the Diocese of Parramatta danced and sang with each other and with the local volunteers who had accompanied them in previous days.